Many of us have seen the series of Monet’s paintings of the Rouen Cathedral at the Musée d’Orsay and have marveled at the difference in the light in each painting. We probably know the story: Monet kept up to 14 different canvases going at a time, and switched from one painting to another as the daylight shifted on the cathedral. It’s almost magical to see the differences. Here’s a great Smarthistory video created by two art historians, Dr. Beth Harris and Dr. Steven Zucker, in which they discuss Monet’s Rouen Cathedral Series. It’s worth a quick five minutes of your time if you’re a fan of Impressionism. What a thrill it is to be able to travel to Rouen (just an hour’s drive from Paris, past Giverny on the way to the Normandy shore) and stand in the very place where Monet stood when he created those paintings. He painted some of them en plein air from the Cour d’Albone in front of the cathedral, but the rest from the second floor of the building across the street, 25 Place de la Cathédrale. Back in Monet’s day it was the Finance Bureau, but today this is the home of the Rouen Seine Valley Tourist Office. It would be from this makeshift atelier that Monet would create 28 different paintings of the western view of the cathedral between 1892 and 1893. All of these paintings were supposedly created in two different painting sessions, which might sound suspicious, unless you’ve actually been to Rouen and see for yourself how quickly the weather changes. You can have sun, clouds and rain all within an hour. Monet might have been forced to switch canvases, not because he wanted to, but because he had to. The light would have been changing so quickly, he wouldn’t get much painting done unless he had multiple canvases. The Rouen Seine Valley Tourist Office across from the Rouen Cathedral. Although the sun is shining, notice the wet pavement. Sudden shifts in weather conditions are common, just as they were back in Monet’s day. And if it’s not enough just to stand in Monet’s footsteps, you can also sign up for an art workshop where you get to paint Monet’s cathedral for yourself. I didn’t find out about this until after I’d left Rouen, but I’m dying to try it the next time I go. Check it out here. The workshop includes a tour of the Rouen Musée des Beaux Arts and a Monet-inspired dinner. If you’re not able to swing a trip to Rouen, you can always catch two of Monet’s Rouen Cathedral paintings in the United States at the National Gallery of Art in Washington, D.C., one at the J. Paul Getty Museum in LA. 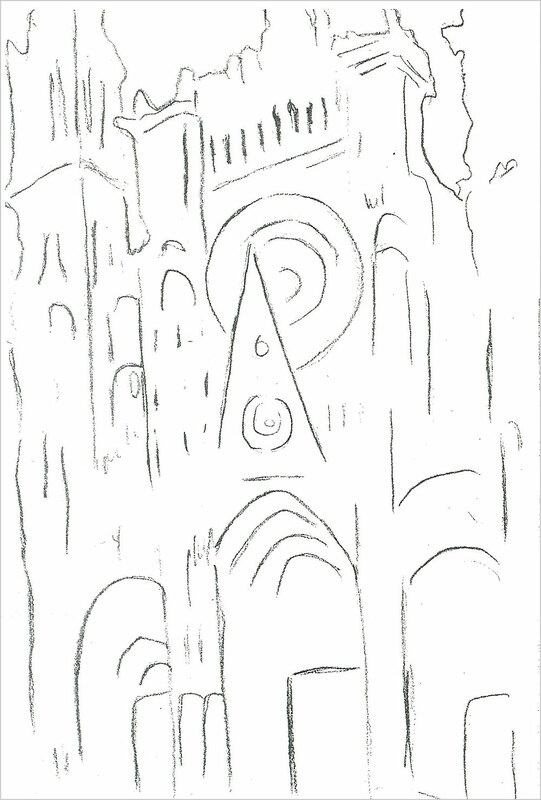 If you want to take your hand at creating your own little Rouen Cathedral masterpiece, you can download this stencil from NPR’s website. If you really want to feel like Monet, download 14 copies and have a go at each one a little differently. Cheers!